1) Know what to expect. If you are getting married this year, talk to a tax professional to discuss what works best for your particular situation. At the very least, you can get an estimate of what you will owe at the end of the year. You may find it beneficial to adjust your withholdings and/or make payments throughout the year to make it easier at tax time. 2) Plan for the future. While tax law negatively impacts married people, there are many other provisions that can help you keep more of your money – particularly if you are planning ahead. Now is the time to look at diverting more of your taxable income into retirement funds. Planning for your children’s education can also provide substantial benefits; there are a variety of tax-favored savings vehicles, credits, and deductions that could be useful for you. 3) Buy a house. If you don’t own a home yet, now could be an excellent time to consider becoming a homeowner and benefit by the mortgage interest tax deduction. 4) Get divorced …or stay married! We say “get divorced” with tongue in cheek – though there are couples out there who have taken this radical measure to save on income taxes. On the other hand, aside from the tax issue, staying married can be an excellent financial idea. Statistically, married people are likelier to have higher long-term net wealth (see our previous post). Even if you’re unhappy about that Marriage Penalty, in terms of your overall financial well-being, marriage might very well be quite beneficial for you and your family over the long run. 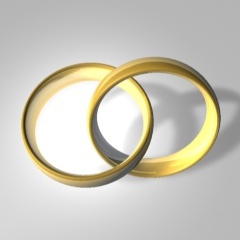 Bottom line: Getting married can impact your taxes substantially. We recommend that you talk to your financial planning professional so that you know what to expect, and how to prepare. A wealth of research and data shows that married people, in general, tend to be better off financially than single people. According to the US Census, in 2010 the median net worth for a married couple between the ages of 55 and 64 was $261,405, as compared to $71,428 for a man heading a household, and $39,043 for a woman heading a household. There are many ideas about why marriage can be financially favorable, from simple economies of scale and pooling of resources, to other theories generating from more nuanced or controversial research. One recent study, for example, found evidence that married men tend to earn better money than their single counterparts (this phenomenon even has a name: the “Marital Wage Premium” ). But married life isn’t for everyone, and we’re not in the business of advocating for or against marriage. There is one big financial drawback, however, for many married couples: The marriage penalty. Yes, it’s true: Many married people bear a heavier tax burden than single people with the same level of income. 1) Income tax brackets are different for married couples vs individual filers. This hurts dual-earner households in particular: When both spouses earn income at the 25 percent rate, for example, their combined income limit is less than double those of single filers. This impacts high-income dual income couples the most; for example, a single person earning $185,000 is in the 25% tax bracket, just under the 33 percent bracket. But for married couples, the 33 percent tax bracket applies to combined incomes of $226,850. Therefore, if this successful individual were to marry someone making $41,850 or more, then both spouses are in the 33% tax bracket – a substantial tax increase. 2) Limits on tax benefits. Many taxpayers benefit by using personal exemptions and itemized deductions to reduce their taxable income. These benefits apply up to certain income limits, and then begin to phase out once higher income tiers are reached. Once again, these tiers are lower for married people than for single people: Benefits start to phase out for singles earning $250,000, but for married couples with a combined $300,000 income (equivalent to $150,000 for each spouse if they earn equal incomes). 3) Standard deductions for children. Under current tax law, unmarried parents can claim up to $15,300 in standard deductions, compared to $12,400 for married parents. Also, when they’re not married, one parent can take a standard deduction, while the other parent is allowed to itemize deductions. This is not allowed for married parents; if one spouse itemizes, the other spouse must also itemize. These little differences can add up to a big penalty for married people with children. So – what are the real impacts of the “marriage penalty?” Researchers estimate that married people pay, on average, anywhere from $100 to $400 per year more in income taxes than single people with equivalent income. But this is just the average number across the population – for many people, particularly those higher-income households, the marriage penalty can amount to thousands, and tens of thousands of dollars, per year. If you are married or planning a wedding, we recommend talking to your tax professional or financial advisor for strategies on defraying some of this tax burden. We’ll post more on this tomorrow.